Somehow we and all the Boston drivers survived the adventure, but not because I was doing anything right. I do not like one way streets. I do not like traffic. I really do not like roundabouts! Who thought those up and why are they all over Massachusetts? They are terrifying! And all the while my GPS was chirping cheerfully, “Proceed to highlighted route. Go southeast on Cambridge Street. In point one miles turn right, then turn left, then turn left,” while I thought things like if I knew how to get to the highlighted route, I wouldn’t need you! and how am I supposed to know which way is southeast? and we’re going in a circle! City driving is all well in good in a city that makes sense, like New York, but otherwise forget it! I was very happy to get back to normal roads. While we were gone, my daughter and the dogs had a run-in with our local bear (this has been like wild kingdom week!) She was out running, and came around a bend in the road. Brave Scouty sensed danger and charged ahead barking fiercely. Jemma skittered anxiously behind Scout and gave a few half-hearted woofs – as back-up she is very back-up and not much help but her heart is in the right place. The bear turned and looked at them all, but then turned away again and continued down the edge of the road toward our house. Being an intelligent lass, my daughter chose not to follow him. She rounded up the dogs (who needed no encouragement!) and went back the way she’d come to her grandparents’ house where she got grandpa to give her and the dogs a ride home. When they arrived, what should they see but the bear circling our house! The dogs ricocheted around the inside of the car barking like mad, and the bear ran off into the woods and really, the drama! The excitement! And I missed the whole thing and had to hear about it on the phone later! There is never a dull moment around here! And as if that wasn’t excitement enough, it’s time for Would You Read It! So grab your Something Chocolate (Au Bon Pain anyone?) and something to sip and see what you think about today’s pitch! The Pitch: Elephant and Dolphin meet every morning by the sea. But Elephant lives on the land and Dolphin lives in the ocean. Elephant eats grass while Dolphin eats fish. Elephant trumpets and Dolphin clicks. How can these two play together with the differences they have between them? Elephant and Dolphin find out how friendship overcomes everything. Rita is looking forward to your thoughts on her pitch! And I am going to try very hard to catch up with everything I missed in the last two days! 🙂 Have a great day, everyone! I know it. They're so big, and you just never know what they might decide to do! 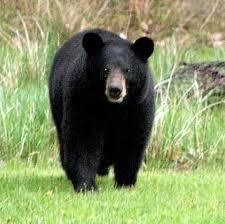 Black bear. But still scary. Thanks so much for your comments, Dana! I know – two different and scary situations – me driving in Boston and a bear wandering around our house – hard to say which is worse 🙂 Thanks for your comments for Rita. What wonderful people you all are. Thanks for your comments. They are truly wonderful, aren't they? 🙂 So helpful and generous and articulate! I would read it. I love elephants. The unique friendship makes me want to see how that works. I'm so with you on Boston traffic. I like roundabouts just not in Boston. Roundabout and bears oh my! I do not like any roundabouts that I have met anywhere to drive in – they all seem so dangerous! but maybe it's just my driving 🙂 Thanks for your comment for Rita! Hi Rita. We love fictional stories that are grounded in “facts,” so I think we'd enjoy yours. I've skimmed some of the comments, but not all, so I hope I'm not repetitive. I think the key change I'd make would be to highlight the conflict. Yes, the animals are very different, but how does this present itself as obstacles the would-be friends must overcome. What happens when they try to talk to each other, share a snack, play ball? I think highlighting the conflict would give the pitch more of a hook. Thanks for your very helpful comment for Rita, Kirsten! Have you looked at the Elephant and Piggie stories by Mo Willems? You might want to check them out just for comparison's sake. Susanna, so glad you survived Boston driving! I've lived close to Boston all my life and never know in which geographical direction I'm going either. Still surviving without GPS…for now. Yes, I would read it! I think this book would interest children to see how these two different animals can come together. If the illustrations were vibrant that would pull a reader into choosing the book, too!